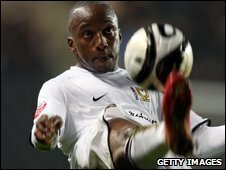 Port Vale have signed MK Dons winger Jemal Johnson on a one-month loan. The 25-year-old began his career with Blackburn Rovers and had loan spells with Preston and Darlington during his time at Ewood Park. In 2006 he joined Wolves who loaned him to Leeds before he sealed a permanent move to MK Dons in August 2007. Johnson spent the second half of last season on loan with Stockport County during their unsuccessful bid to avoid relegation from League One.